Police Scotland is now “working closely together” with officers investigating finds at Heathrow and London City airports and Waterloo station. Assistant Chief Constable Steve Johnson of Police Scotland said: “The package sent to the university was not opened and no-one was injured. A controlled explosion of the device was carried out this afternoon by EOD. “There are similarities in the package, its markings and the type of device that was recovered in Glasgow to those in London. “Therefore, we are now treating it as being linked to the three packages being investigated by the Met in London and both investigations are being run in tandem. The university said it was acting under advice from Police Scotland as it closed a number of buildings, cancelled classes and sent staff home. The package was discovered just one hour before another suspicious item was discovered at the University of Essex. A 100m cordon was placed around a section of the university while Essex Police launched an investigation. 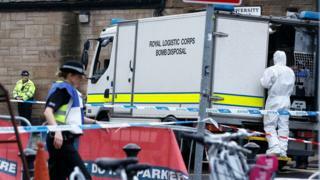 On Tuesday three “small improvised explosive devices” were found at sites across London, the Metropolitan Police said. The airport said it would support the police investigation into the “criminal act”. The force’s Counter Terrorism Command is treating it as a “linked series” and “keeping an open mind” about motives. Irish police are assisting the Met as the Heathrow and Waterloo packages had Republic of Ireland stamps. Met Deputy Assistant Commissioner Dean Haydon said officers had found “nothing to indicate motivation of the sender”. A number of police cordons in and around University Avenue in the west end of Glasgow remain in place until further notice. Police made clear, however, there was no ongoing risk to the public. A number of buildings at the University of Glasgow were closed off including the Boyd Orr Building, the mailroom, OTC, Wolfson Medical Building and Bower Building. Others sites that were later closed included the Isabella Elder Building, James McCune Smith Learning Hub, the Joseph Black Building, the Kelvin Building and University Gardens. Classes in these buildings were cancelled with hundreds of students affected. Staff members were later sent home. University Gardens and part of University Avenue were cordoned off by police. However, at about 16:00, the university tweeted that police had advised the incident was “now over”. A spokesman confirmed all university buildings, except the mailroom, were operating as normal. Earlier on Wednesday the Royal Bank of Scotland HQ at Gogarburn in Edinburgh was also evacuated after a similar report. However, Police Scotland confirmed that the package posed no risk to the public and contained promotional goods.